Screenshot of logo courtesy of www.zombiesrungame.com. Today, I came across one of the coolest motivational tools I have ever seen for runners (or walkers), and I’m super excited to share it with you, readers! What is this super-awesome new tool, you say? Well, let me introduce you to Zombies, Run!, “an ultra-immersive running game and audio adventure for the iPhone, iPod Touch, and Android” created by London-based company Six to Start and writer Naomi Alderman. Like other running apps, Zombies Run! will provide you with your distance, time, pace, and calories burned for each of your runs, as well as allow you to play your own music. 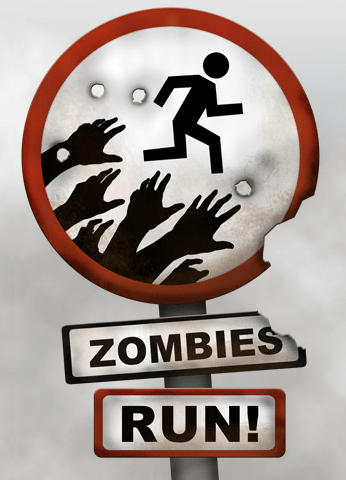 Unlike other running apps, though, Zombies, Run! actually gives you a reason to run in the form of a zombie apocalypse story. In the game, you are Runner 5, one of the survivors of a zombie apocalypse. Each of your runs will be treated as a mission, and, as you run, you will get updates and orders through your headphones that will lead you through the storyline of the game. During these missions, you will have to avoid the zombie hordes, as well as collect important items for the survivor’s base camp, like medicine, batteries, and ammunition. These items will be added to your inventory automatically as you run, and it is up to you to decide what to do with them upon returning home. By building up your base camp, you will unlock new missions and new parts of the story. The more you run, the more you will learn about who (or what) is behind the zombie apocalypse and what the plans are for re-colonization! One of the best parts of Zombies, Run! is that it is designed to work anywhere and is not dependent on your speed or ability. You can run outside, jog on the treadmill, or take a walk and still participate in the story. The creators achieved this versatility by allowing the app to use both the GPS and accelerometer features of your iPhone, iPod Touch, or Android device. Zombies, Run! will be available in February for iOS and later in the spring for those of you with Android devices. It is currently available for preorder at a 40% reduced price of $12 (or 2 for $20) on their website. The preorder is for “Season 1”, suggesting that there will be sequels (or new seasons) of the game that will allow you to continue the story, which is a very promising prospect! Also promising is the planned RunKeeper integration (Nike+, too, please?! ), so those of you who use that service will not have to stall your mileage progress by switching to Zombies, Run!